dream Home, perhaps, every child, regardless of age, to have a dog. certainly, deciding to have a pet, it should be clearly understood, that responsibility and care will fall on the shoulders of the whole family. It is therefore important to take this step deliberately. Taking responsibility for animal life, We need to realize, dogs for kids is not interior decoration or trendy entertainment. the next 10, and sometimes 15 s favorite dog becomes almost part of the family. It does not matter, who dreams about a dog – parents or children. In any case, you need to carefully study the characteristics of different breeds. There are dogs for children, that they truly love. They become the best friend of the kid, play with him, gives him joy, and eventually make it a childhood filled and happy. The second important point – the complexity, associated with caring for pet. We need to be alert to the, that at first the puppy will deliver any inconvenience. It pools in unexpected places, broken vase, bitten shoes. Normal, healthy puppy, regardless of breed, – pretty naughty, restless creature. When choosing a dog breed for children, should take into account the, that some of them are not suitable for games. Therefore, the adoption of a decision should be based on the target animal establishments. Will she entrusted the protection of houses and flats, help in the hunt. Or is it just the opportunity to make a new friend. Each animal has its own character. Often it does not depend on the breed. It can be aggressive, mentally unstable or calm, gentle and quiet. Endurance. Many families make the choice of breed, based on the widespread belief, that small, indoor pets do not bring harm to the baby. But young children can often be harsh and even cruel. Therefore, a dog with a fragile constitution could severely suffer from careless actions of the child. In this case, even a small Pekingese perenervnichal may bite baby. Energy. When choosing a dog for infants preferred species, which differ in activity and are able to withstand endless children's games. Besides, you need to consider and family life. If the family enjoy outdoor activities, sports games and forays into nature, will approach one breed. If a favorite leisure – home entertainment, such as watching TV or reading, then you need to choose another breed. Intelligence. Any breed needs training. for families with children Dogs, especially small as early as possible must learn, that allowed them for pets and other kids, and that is categorically unacceptable. Besides, dog with a developed intellect will be able to protect your baby. She is able to distinguish between normal childhood pranks from a dangerous situation. Friendliness. Most often it is the quality of an individual feature. It does not depend on the breed. But for a family with a baby need in advance to exclude those breeds of dogs, who do not like children. It is best to choose the nature of the animal to the peculiarities of the child's personality. Quiet the baby is not suitable, eg, beagle. he is playful, neposedlivyj, so communication with phlegmatic host will be a real torture for beagle. 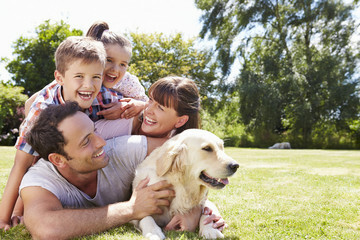 Child's interest in pets may eventually dry up. This is typical for children of preschool age. With age, hobbies become more diverse. Children are able to combine study, additional classes, hobbies and care of animals. Immediately to explain, that pet is not only cooperative play. With it, you need a daily walk, regularly wash, comb, treat. social adaptation. Even shy children become more talkative, liberated, free with peers. 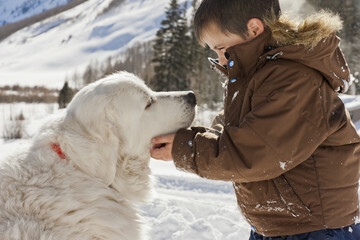 Besides, When the child grows up and begins to walk alone with their four-legged friend, he unwittingly begins to communicate with other dog owners, expands its circle of friends. It is often, as some children show off their pets, while others envy them desperately and asked to show and play with the dog. Little master becomes the center of attention in any company of children. Boys dream of large dogs, and for girls is better to choose small, superficially attractive breed. Accountable for their actions. This is a very valuable human quality, and ring games with toys or with your favorite smartphone are not able to develop its. Having a pet, kid knows, it is a living being depends on it. He gets used to a certain routine of the day, It begins to perform certain duties. Empathy and kindness. Dogs help bring up tolerance to other people's shortcomings. When communicating with the pet child acquires important human qualities: honesty, devotion, tolerance, forgiveness. self-discipline. The habit of getting up early to walk with pet, monitor its power, health. Even the boys become more attentive, neat. These teens practically does not cause trouble to their parents. Getting rid of loneliness. It is particularly important to have a dog shy children, as well as the, whose parents work all day and come home only in the evening. The kid will feel abandoned, lonely. 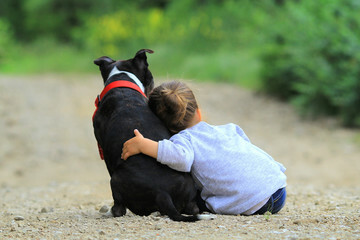 Dogs for children are a true friend: listen, console, cheer up. Children are very happy to talk to them, entrust their secrets, fears, dreams. On this most modern parents often do not have enough time. Freedom from fear. Some people say, that the child is afraid of dogs, so they do not want to start a pet. However, in most cases, the appearance of a puppy eliminates this fear. 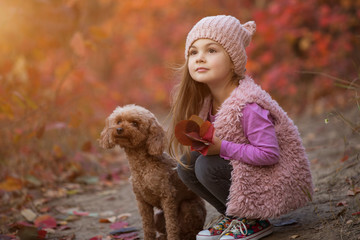 In children, there is a sense of pride for their four-legged friend, increased self-esteem. The psychological state of a person after talking with the dog becomes more harmonious. After all, they are incorrigible optimists, always full of joy, charge this mood of their owners. 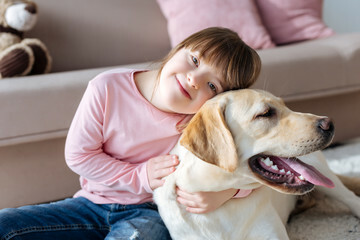 Many doctors recommend to start a dog families with special children. 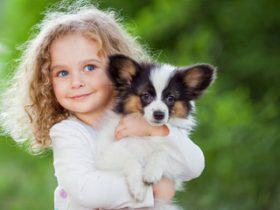 Pet is beneficial for children with autism, cerebral palsy. noticed, children, who have a dog, less sick. They have reduced the risk of asthma, allergy development. Besides, walk in the fresh air, enhance immunity, children get sick less colds. The dog face child gets the best defender, especially when next to it a large and toothy dog. Even small breeds of dogs for children are capable of barking to scare the offender, instill confidence in his master with his presence. Dogs for children can bring some inconvenience. This is especially true of small puppies. likelihood, that his barking he'll wake the neighbors every night, small. However, the familiar comfort is still broken. Be sure to take into account the interests of the existing house pets. Most often, the dog gets along well with other animals. but, eg, It is not recommended to start a hunting breed, if the house has rodents or birds, because it can trigger the hunter instinct. The financial side of the issue. The content of a pet will require the allocation of some proportion of the family budget. This purchase bowls, benches, collar, leash, stern. You need to pay for vet. We need to be alert to the, that the puppy will chew on everything, from shoes and ending with wallpaper. Taking care of a dog often falls on the shoulders of adults. The child may get bored fed puppy, daily walk with him. When the puppy home, the first time it is recommended not to leave him for a long time one. He has to get used to the environment, to their new owners. In the family circle it is necessary to discuss these important issues. Then divide responsibilities between the household, assigning some of them young master. When choosing a breed the main factor is the age of the future owner. Not recommended for children under the age of animals start 6-7 years old. If, nevertheless, the decision was made, all games and socializing with animals baby must necessarily take place in the presence of senior members of the family. Dog for a child 5 and younger require care, who can not afford child, so the whole care of the pet will fall on the shoulders of parents. The kid is not usually aware of, the dog is a living being. Since it must be treated carefully, carefully. It can firmly squeeze her, pulling ears, tail, unintentionally harm her health. children 6 to 12 years been able to perform some simple duty to care for animals. for example, enclose it in a bowl of food. AT 10 years and can be trusted to walk. But it is still better to charge older children simply because, that the dog can break the leash and run. Best dogs for children of primary school age - the small and medium-sized breeds. If a dog give birth to young people aged 12 years old, you can opt for larger animals. Thus it is necessary to explain, that a large dog will require increased attention to education. older adolescents 12 years can be trusted completely for dog care, but the walk to it is best done in conjunction with parents. Despite the fact that teenagers are happy to take the responsibility to feed the pet, should regularly monitor the fullness of food bowls, clean water. When choosing a pet, regardless of age, one principle is to give preference to good, pokladystыm, non-controversial animal. aggressive breeds, guard – not the best choice, even if they do a good home security functions. good character, a lot of patience. Children love to squeeze dogs. sit on them, give her various inconveniences. unacceptably, to the animal response to such unpleasant moments, would growl. And in any case, it should not attack, biting toddler. The coincidence of the characters. Restless tomboy need a fairly active puppy, who tirelessly will play, have a good time. To do this, the dogs are well suited for small children such breeds, like Collie, dalmatintsы, labrador. for home, quiet guys best suited phlegmatic, adorable pug or Maltese. Perhaps, the main requirement of the dog – resistant animal psyche. Wool. If there is a risk of allergies in children, better to choose short-haired breeds, they shed less. It is possible to give preference to such species, how he, papylon, Collie York, ʙişon, poodle. Chinese crested or a hairless Terrier is an ideal choice for children with allergies. In any case, before purchasing a puppy is best to take a test for sensitivity to a protein coat. If a child insists on a long-haired breed, you can just bathe more often, do trimming outside the apartment. Animal with long hair, certainly, It requires more time to care, than short-haired individuals. For the baby is best to buy female individuals, so they are more complaisant, without problems obey the little master. The cost of a puppy, pedigree. Popular breeds usually are not cheap. But the purchase of a dog for the children in the market can lead to big trouble, associated with genetic features. Professional breeders usually the manifestation of aggression once the entire litter is rejected. Propensity to disease. The loss of your beloved pet, He became a member of the family, lot of stress for all family members. So do not choose a breed, susceptible to the disease. It is better to buy a dog-longevity. For girls is better to give preference to decorative rocks. This may be a miniature poodle, Yorkshire Terrier, Chihuahua and Chinese Crested. For them, there are a large number of orders, accessories, jewelry. They tolerate the whims of their young mistresses, including a tying ribbons. 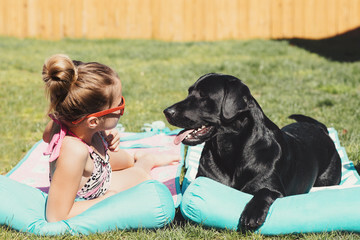 size of the dog for children should not be a determining factor when choosing a. So, not suitable for small baby, decorative dogs: pekines, Chihuahua, pomeranskiy Spitz. They do not tolerate rough embrace and arrogance, can bite or frighten the child. Decorative rocks are fragile. The kid can come to a puppy or even sit, so myself pet may be seriously harmed by careless actions. Best breed for children among the miniature: welsh corgi, fee, Miniature Schnauzer, terriers. They do not differ excessive touchiness, vindictiveness. 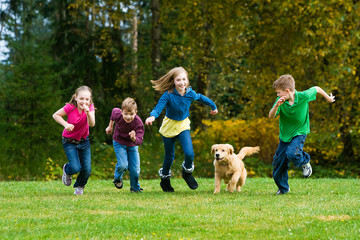 Topping the list is the best breed of dog for a kid unflappable Retriever. Despite its size, he was not able to hurt, baby bite or growl at him. Giant animals for the kid better not to have. for example, newfoundland, can knock the little man with even a simple leg, careless movement of the tail. Dogs of medium size suitable for ages 10 to 12 years old. for example, spaniels and retrievers - very good, loyal pets. However, they require training from a very young age. Dog for large breed children a better start to the teenagers about 12 years old. Besides, they are a great friend, they are able to protect his master in case of danger. For kids best suited nanny dog. The main quality of these breeds is, that they understand, when the baby behaves very well and immediately called the parents. they are patient, able to withstand endless games with the child. At the same time, these dogs rapidly uptake, when he is in danger, able to defend it even at the cost of his own life. Ordinary pooch can be a great friend, give its owner a lot of love and joy. Dvornâžki - unpretentious, creating dedicated, able to protect the child at all costs. Bobtail - calm, easily trained dog for a child 3 age and a little older. Even year-old kid can be without fear to have such a friend. Him with it will fun, safely. Poodle. You can pick up and dwarf, and more varieties of this breed. they were friendly,, active and intelligent. A young landlord would be happy to teach this dog a variety of tricks. Basset Hound - very good pet with a sweet temper. Golden Retriever is infinitely faithful, tolerant breed for kids. They are able to get along with any other pet. Bernard - the best dog for the protection of children and. No wonder he has earned the title of his character rescuer. Newfoundland. This breed loves to tinker with children, roll them myself, play with them. The giant Schnauzer is a loving and kind dog. Cane Corso baby will be a faithful friend. Boxer has increased loving little children. Sharpay. Despite the coolness and slowness, dog is capable of when there is a risk with a desperate fury to defend his young master. The border collie is a herding dog, able to faithfully love and participate with the child in all its games and entertainment. The Cocker Spaniel is especially suitable for restless children. This affectionate, playful, very good creatures. How to draw a rabbit? Toilet for the kitten, how to teach? As the puppy to instill the concept of toilet? How to feed a kitten?